To make it fit for this historic moment, the Pamiris have cleared and smoothed the rocky ground with their bare hands. The sparkling Panj – shallow and swift-flowing – divides Tajikistan from Afghanistan, and the Afghans here sit on their bank of the river, awaiting a glimpse of the Imam from afar. 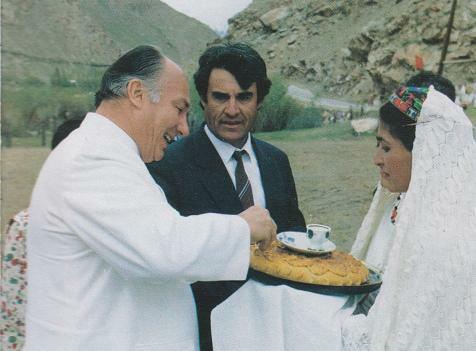 The Aga Khan partakes of a morsel of bread dipped in salt during his historic visit to Badakhshan in 1995. This was the first ever visit in centuries by an Ismaili Imam to this part of the world. …the Pamiris remain the most human of people. Everyone has books in the house. Residents take turns sweeping their courtyards clean. People with only bread to eat unsparingly offer all they have to guest. Midnight, and the people of the Pamirs are waiting, their dark shapes dimly lit against the flames of 450 bubbling caldrons in this narrow valley on the Afghan border. A steady rain falls as they stir their caldrons and wait. There is no hurry. They have been waiting 1,000 years. The Aga Khan is coming here, to the vaulting, nearly unreachable Pamir Mountains. 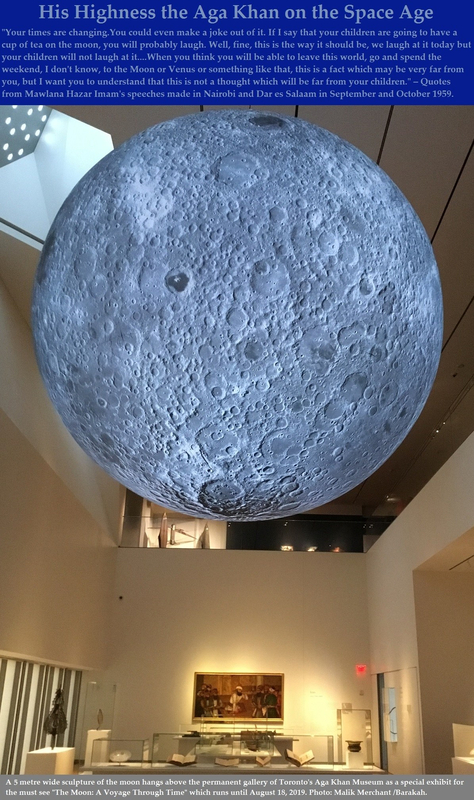 Since early evening his followers have been arriving on foot, by car, by tractor or packed like bolts of brightly colored cloth onto the backs of trucks. Happy and excited over their Imam's visit, many travelled on foot for hours to see him, while others made to the site on the back of trucks. To much of the world, the Aga Khan is known as a fabulously wealthy prince, a lover of fine racehorses and the son of Aly Khan, who married Rita Hayworth. But to the starving people of the Pamirs, he is the long-awaited Imam, the spiritual leader of the world’s 15 million Ismaili Muslims, who has come to save them from hunger and after centuries of isolation open a path to the world. In the morning, 50,000 people will greet him, and the men are busy cooking enough rice in the great caldrons so every person can feast. The Aga Khan, who is 58 [May, 1995] and lives in Paris, is arriving at a precarious moment in the history of the Pamiri people. The dissolution of the Soviet Union in December 1991 brought them only misery, and only misery to Tajikistan. 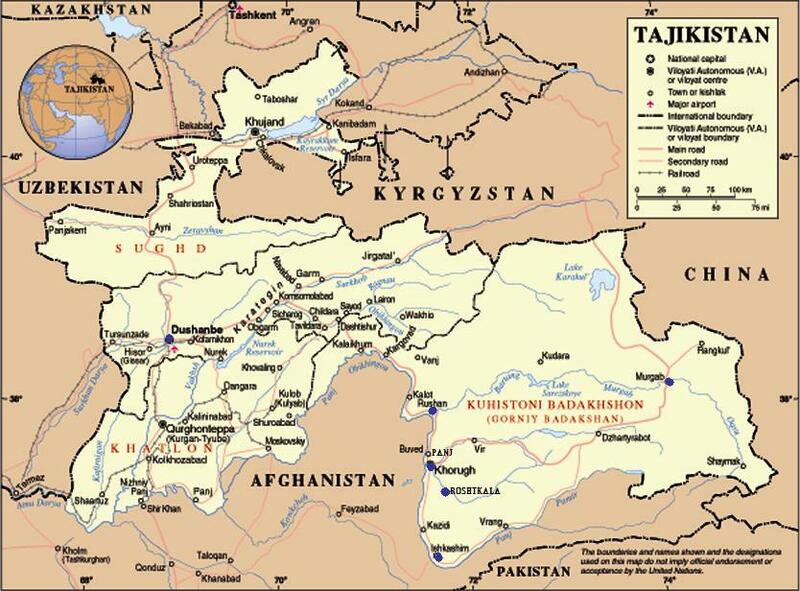 Always the poorest part of the Soviet Union, Tajikistan was further impoverished when Soviet authority was succeeded by rival clans who embroiled the country in civil war. At the end of 1992, a Communist-oriented clan prevailed. Anyone living in Dushanbe thought sympathetic to the democratic and Islamic opposition was rounded up. The Pamiris, an ethnic group of only 100,000 people, were hunted down. Many were never heard of again. Pamiris living in Dushanbe fled for their lives. Many of the opposition fighters fled to this valley or traveled a few miles farther into Afghanistan. The Dushanbe government blockaded the entire region, called Gorno-Badakhshan. The authorities said they had to stop the movement of fighters and arms. 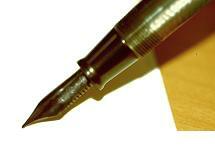 The people of Badakhshan say the authorities were bent on extermination. The result was the near starvation of the 218,000 people who live here, 100,000 of them Ismaili Muslims. At 4 a.m. in the village called Barchit, the Shojamolov family is waking and preparing to walk the 6 miles to Porshinyov. “My deep and heartfelt prayers are with you for your happiness and well-being,” says the Aga Khan. “Though I will be leaving you, please remember at all times you are in my heart, my thoughts and my prayers.” Tears streamed down Mirzojalal Shojamolov’s face. 1995: His Highness the Aga Khan, 49th Imam of Shia Imami Ismaili Muslims, pictured giving an Irshad (direction, guidance) during his visit to Badakhshan in 1995. The Shojamolovs built their adobe house themselves and in the traditional Pamiri style. The door opens onto an L-shaped room that has a wooden sleeping platform about 3 feet high, covered at night with brightly colored quilts. The sleeping room adjoins a living room with another platform, this one with two tiers, and the family sits cross-legged on cushions on the lower one and keeps wooden chests with their belongings on the level above. Heat comes from a wood-burning stove. They haul water from an outdoor spigot that serves all 90 villagers. The toilet is an immaculately clean outhouse. They live in enormous poverty amid great splendor — the mountains of Tajikistan and Afghanistan crowd on either side of them, so close and high they appear unreal. The Shojamolov family – elderly parents, three grown sons, a daughter, daughters-in-law and grandchildren – join the stream of pilgrims. They are heading to an open field on the banks of the Panj River. During the Soviet years, Islam could be practiced only in secret and religion was more a strand of culture than a belief. 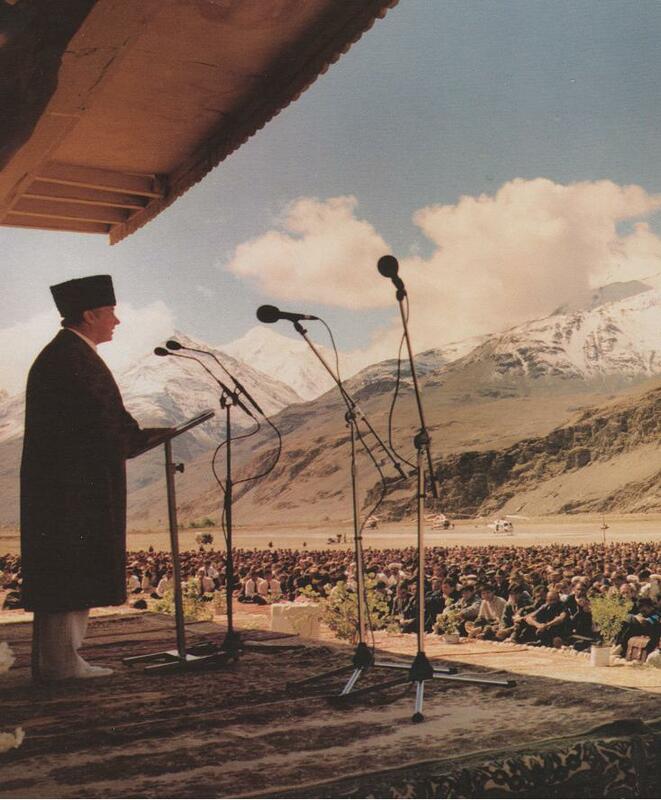 His Highness the Aga Khan made his first historic visit to his Ismaili followers in Tajikistan in May 1995. He granted mulaqats (audiences) in Dushanbe, Khorog, Roshtkala, Murghab, Sijd (not shown), Ishkashim and Rushan (all dotted with blue). The town of Porshnev, where the story was reported from, is approximately 12 kms from Khorog. In March 1993, the Aga Khan Foundation began distributing humanitarian aid — flour, powdered milk and oil donated principally by the United States. And the memory of the old religion began to stir, and people resumed waiting for the Imam, as their ancestors had before them. 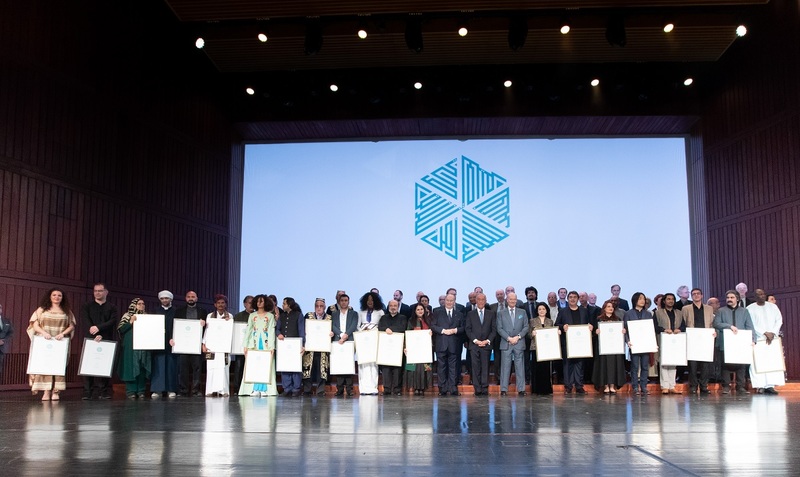 “Badakhshan is one of the few regions in the world closely connected to the Ismailis from the earliest times to the present,” says Farhad Daftary, head of academic research for the Institute of Ismaili Studies in London. “The isolation saved the community from numerous waves of conquest. The Pamiris belong to the Shiite branch of Islam but are a distinct sect, and they are a tiny minority in Tajikistan. Though the Pamiris have been Ismaili Muslims since the 10th century, their spiritual leader, first based in Syria and later in other Middle Eastern countries, never reached these mountains. 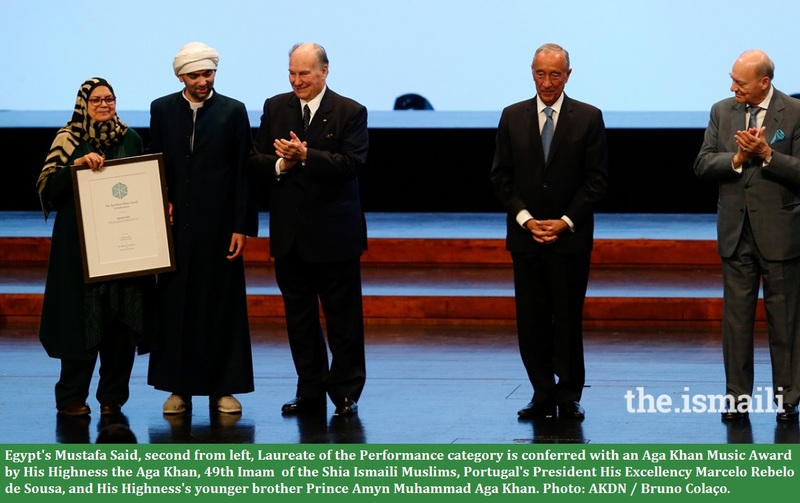 Today’s Aga Khan, Prince Karim, is the sect’s 49th Imam. He is Swiss-born and Harvard-educated. Ismailis believe he is a direct descendant of the prophet Mohammed. 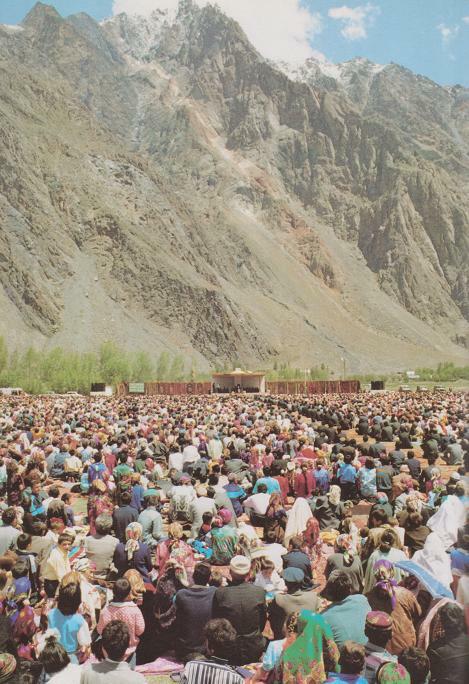 The Aga Khan in Murghab on 26 May 1995. He told his audience who comprised of Ismaili and non-Ismaili Muslims: "Today, the Ummah is constituted of hundreds of millions of Muslims and who are bound by their faith - the Shahada, La-illaha-Ilallah Muhammadur Rasullillah - and yet, who over centuries have come to live in different climates, speak different languages and who differentiate in some interpretations of their faith." Robert Middleton, director of humanitarian aid for the Aga Khan Foundation, says the Soviet Union destroyed a culture here that previously sustained itself with agriculture. Moscow was the sole source of the diesel oil. When the oil shipments stopped, there was no fuel for buses, tractors or generators. Moscow also forced Pamiris onto inefficient collective farms; for defense and strategic reasons people were sent to regions that were virtually uninhabitable. A hydro-electric plant near Khorog, completed with the assistance of the Aga Khan Foundation and the US Department of State. Now the Aga Khan Foundation is developing a hydroelectric system with U.S. aid and helping the Pamiris restore their past. They’re going back to plowing with bullocks. In Khorog, a town of 20,000, people live in four-story Soviet-era apartment blocks, buildings without running water. The residents walk several blocks to a three-pit outdoor toilet – a hole in the ground serving 100 or more families. The stench of human waste fills the neighborhood. Despite such degrading conditions, the Pamiris remain the most human of people. Everyone has books in the house. Residents take turns sweeping their courtyards clean. People with only bread to eat unsparingly offer all they have to guests. 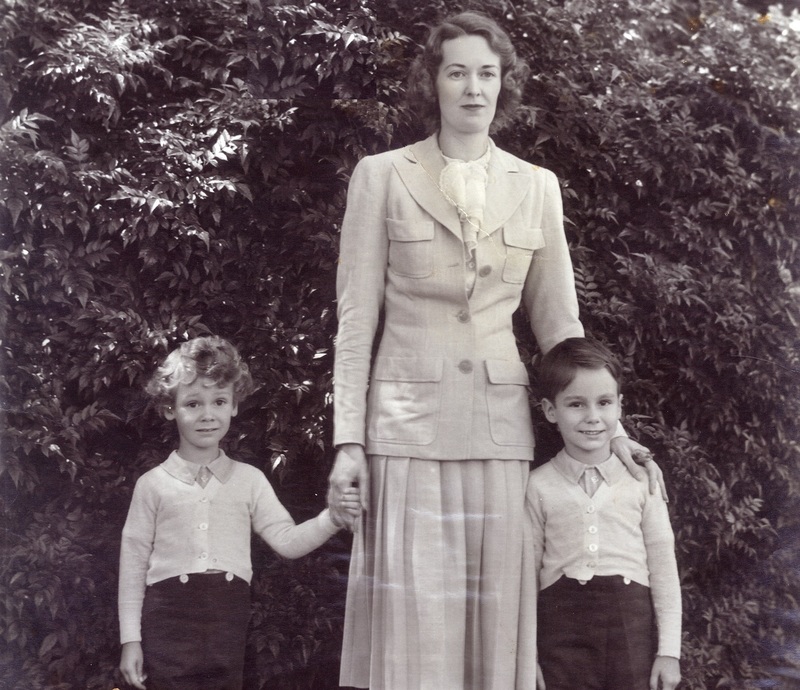 Mrs. Navrusova unhesitatingly gives the only thing she has, the necklace around her neck. An old man stays up all night to carve wooden spoons – for the simple joy of giving. 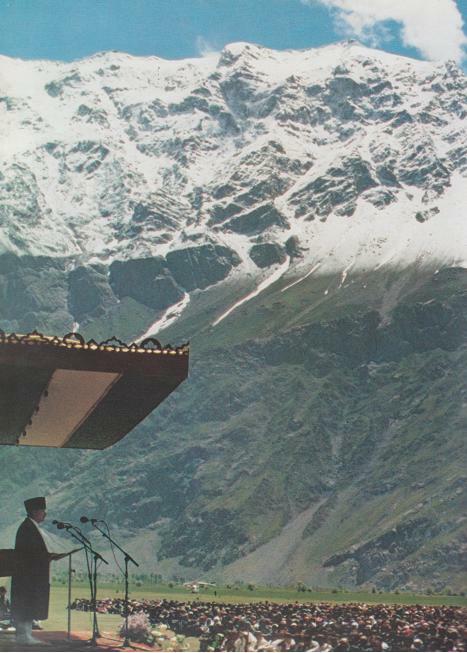 The Aga Khan told his audience in Rushan on 27 May 1995: "The Qur'an refers very often to nature as a reflection of Allah's power of creation, and it says, look at the mountains, the rivers, the trees, the flowers, as evidence of Allah's love for the people whom He has created. Today, I look at the environment and I say to you, I believe Allah is smiling upon you, and may His smile always be upon you." Finally, on this Wednesday late in May, the Aga Khan arrives. He is chauffeured along a road lined with plants people have taken from their homes – geraniums sitting in old soup pots, houseplants in pails. The 50,000 people sit rapturously on their rugs, spread out before him. The men wear round, bright skullcaps, a riot of flowers in green and red. The women wear loose trousers covered by long, vibrantly colorful dresses. The Aga Khan – wearing a black Persian hat, a cream Nehru-style suit, with a long, flowing purple coat covered with gold filigree – walks regally through the crowd. He speaks in English. A translator repeats his works in Tajik. “My deep and heartfelt prayers are with you for your happiness and well-being,” he says. Tears streamed down Mirzojalal Shojamolov’s face. Throughout the ceremony, Russian military helicopters called Crocodiles have been buzzing overhead, drowning out some of the Aga Khan’s words. The attack helicopters belong to the 25,000 Russian soldiers stationed along the border with Afghanistan, at the request of the Dushanbe government. Opposition guerrillas cross from Afghanistan at night and harass the Russian border guards. Today, many had mixed in with the crowd to hear the Imam. As the ceremony ended, the Crocodiles drifted down, nearly silently, then roared along the river, frightening the crowd. 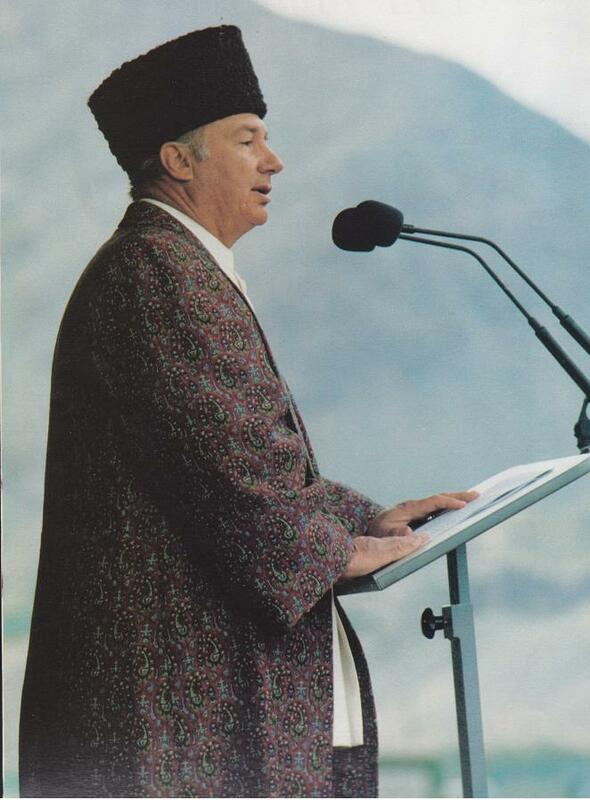 The Aga Khan in Ishkashim on 27 May 1995. He said, "Differences must be resolved within the ethic of our faith, through dialogue, through compassion, through tolerance, through generosity, through forgiveness." Referring to the diversity of the Muslim world and the differences in interpretations of the faith the Aga Khan said in Khorog on 24 May 1995: "Nothing is gained by imposing one interpretation upon people disposed to another. Indeed the effect of such coercion is a denial of the principles of the faith....Shia and Sunni can co-exist and co-operate, true to their own interpretations of Islam but confederates in faith...Human genius is found in its variety, which is a work of Allah." For one ecstatic meal, all ate their fill. And they began waiting once more. The above article, Famine, then feast for Tajik Muslim sect, has been reproduced on this web site under a licensing arrangement with The Baltimore Sun, Maryland, USA and is copyright. Click Home page for quick links to recent articles or if this is your first visit to the web site. For links to all articles on this web site please click What’s New. 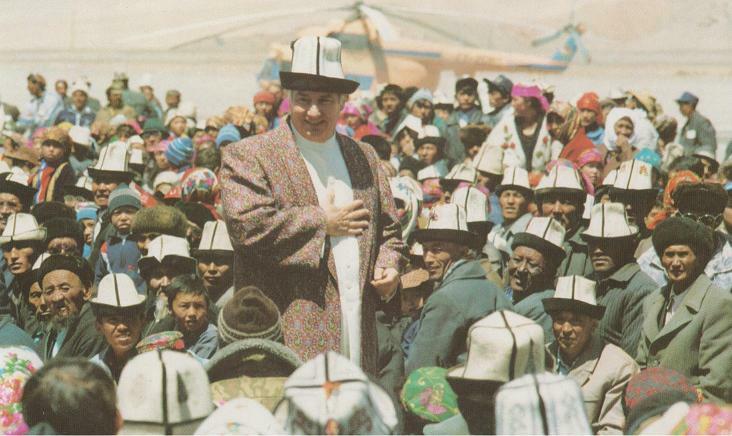 Special Issue of The Ismaili (Mawlana Hazar Imam’s Visit to Central Asia, 22 – 31 May 1995). Great article. Thoroughly enjoyed it. Made me feel that I was in Tajikistan with Mawlana Hazar Imam & the Tajik Jamat. GOD bless the Tajik Jamat. Have just read this article and feel thrilled and sad at the same time. Coming from an American news correspondent, the article brings out the real lives that our brothers and sisters live in these mountainous regions. Having been there some years ago, both Zubeda (who worked in Khorog in 1996 as a teacher trainer for six weeks) and I have met the people and experienced their hospitality and continue our friendship over the thousands of miles via skype and email. I am overjoyed to visit this site and I pray for Peace, Luck and Success of All Ismaili Brothers and Sisters, and especially for the Ismaili Jamat in Afghanistan. I was among the blessed and fortunate ones to be there and be witness to the miracle of His presence, for which I am forever thankful. I am excited enough by visiting this page and by excitement my tears were near to flow. I kept the pictures in my personal record for future view. I pray and my heart prays for the peace in the world and for the spiritual development of human being. May Allah give light, brightness and shine to our hearts.